Providing professional training and consulting, Fidelity Safety & Training LLC is a boutique firm specializing in safety training, safety compliance, and loss control for private, educational, and governmental institutions. Founder, Garth A. Maijala has over 30 years of experience in training and safety. We have the capability of handling everything from routine, daily issues to major concerns of managing an effective training and safety program. We understand that training and safety may not always be on the front burner, but we can assist your organization in reducing costs and management’s time. Headquartered in North San Luis Obispo County (midway between Los Angeles and San Francisco on California’s Central Coast), Fidelity Safety & Training LLC is available to provide free quotes and custom programs in California, Arizona, and Nevada. Our specialties include food safety training, food allergy training, professional standards training for public schools and forklift operator training. 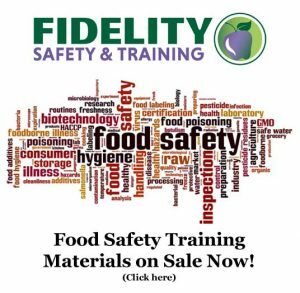 Fidelity Safety & Training LLC works in conjunction with related firms in California to provide a full range of services and is also a member of the California Schools Nutrition Association and National Environmental Health Association. Since 1999, we have provided services to thousands of clients in 29 California and Nevada Counties.